Outstanding young singers and pianists explore an important yet almost unknown repertoire. 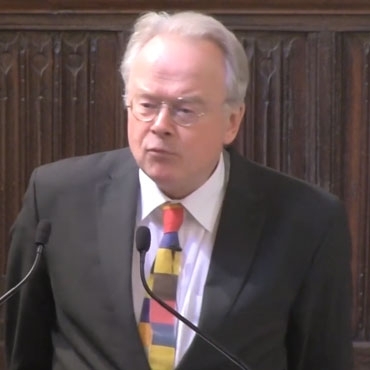 David Owen Norris considers questions of style, word-setting, form and rhetoric, explaining how Sir Arthur Sullivan achieves his expressive ends. This event is held in collaboration with The City Music Society, The Worshipful Company of Musicians, The Sir Arthur Sullivan Society and The University of Southampton. I am going to begin with a completely typical Sullivan song. We will find, during the course of the day, that Sullivan’s songs vary a great deal, but I am going to begin with “The Sailor’s Grave.” Composed in 1872, this is a poem written by H.F. Light, who wrote “Abide with me” and “Praise my soul, the king of heaven.” I shall play the introduction. Notice that it begins with a wide, rising interval, in this case an octave. The music then falls away, into what you might recognise as Brahms. We find habits of thought taken from the great, nineteenth century German masters throughout Sullivan, but with a peculiarly Sullivanesque accent. I shall talk about this in more detail later. Following this introduction, the voice comes in. We hear how Sullivan begins with repeated notes, and then uses a wide vocal interval - the interval of the sixth. After two verses, Sullivan appears to show us a better tune. At first, it feels like a new sweep of melody, but we soon realise that Sullivan is playing a trick here. This is something that Brahms is also very good at. We tend to think of passages like these as tunes, but in fact, when we analyse them, we find they are a series of gestures and textures. This is what Sullivan does in this central section. There is a very interesting discrepancy between the original editions in F and in E Flat in this section. The E Flat version includes a discordant melody note. We shall come across several cases today where even the original editions are different from each other, and then it is quite important to work out the original key in which Sullivan composed his song and from which it was subsequently transposed. It is not always possible to tell that. In the case of “The Lost Chord”, the manuscript in the Barbican Library tells us that it was originally composed in F.
Sullivan is very keen on cramming as many notes into his chords as he can, without ever being discordant. This is one of the reasons why he was so popular. If you compare Sullivan’s harmonic language with the harmonic language of his teacher, Sterndale Bennett, you will find that Bennett is nothing like as sensuous. An ear for beauty comes across again and again in Sullivan’s work. This little quasi-tune ends with a wonderful vocal gesture, which I will attempt to inflict upon you. The really extraordinary thing is that, suddenly, we get a real tune, and it is a tune where the voice leaps up a fourth to the key note and then falls down again. Sullivan knows when to interrupt a cadence. So we do not get a sound like this [plays], which sounds a bit like Elgar. Instead, Sullivan plays like this. Then, the bass, having made its presence felt by playing an unexpected note and interrupting the cadence, does a thing which Sullivan’s basses particularly love to do: it marches down the scale. This very real tune is nothing other than the introduction. Now, it might just be that I have looked harder at Sullivan songs than anybody else’s songs, but I do not know anybody else who does that. As we shall see, Sullivan does it more than once, and it seems such a good trick. You bury something in the introduction, which at first seems like nothing much, only for it to reveal itself as the major duel of the song. And we carry on going up. Now, Sullivan does not always do that. Interestingly enough, the reason that he does it here is a bizarre image in Light’s poem. The sailor has been buried at sea, and on the day of resurrection, he shall leap from the waves. There is an awful vision of the shrouded corpse shooting out of the sea and up like the rising Sun. This is why, I believe, Sullivan has included this rather unusual device at the end. I hope that by now you will have gathered that Sullivan is playing with our expectations of melody. If you read Newman Flower and Herbert Sullivan’s book, you will find that they seem to regard Sullivan’s compositional process as being purely concerned with melody. Of course, Sullivan was particularly good at tunes, but there is a lot more to composing music than thinking of a good tune. The fascinating thing about Sullivan’s songs is that we see him toying with what a tune might be and what it might turn into instead. For that reason, I am going to move on to the 1866 Shakespeare song, “Orpheus with his Lute”. This does not have a tune. We think that it has, but it is really a gesture. Finally, the voice comes in. You will be pleased to know that the voice never has to sing that gesture. It sings the absolute opposite to that gesture: a long note that does nothing. Now is perhaps the time to pose the question: how do you pronounce “lute”? I say “loot” and Elizabeth Kenny, my colleague at Southampton, one of the world’s great lutenists says “loot” too. Dame Felicity Lot, however, when singing this song, is careful to sing “lee-oot”. I mention this because there is a case to be made for singing words as Sullivan would have sung them. However, there is a much better case to be made for singing Sullivan songs so that people listening to them are not put off by an artificial barrier. We started off in B Flat and we have got to G Flat, which is a major third away – very Schubert-ish! That is to say, the D Flat in the bass is delayed by a bar. The grammar, the syntax, is different. “To his music, plants and flowers ever sung,” but… “In sweet mu-sic…is such art…” There is a reason in the text for changing that note. It is very often corrected. Of course, without seeing the manuscript, we cannot be exactly sure whether Sullivan really wrote that, but it is rather a nice change. Just in passing, I might say that Sullivan very rarely writes the same thing twice. Some later editions of his songs try to put two verses into a repeat system. The most telling disaster that I came across was a Paxman edition of “O, Mistress Mine”, which had forced Sullivan’s two verses into a structure that could be repeated. Thereby, they had omitted three bars altogether; they had got a modulation wrong missed out one or two other things. So, the fact that Sullivan does things differently makes me think that this change is probably deliberate. …which is a Bach-like progression, but I do not think Sullivan wanted that. We have already seen that Sullivan is quite happy to have a discordant melody note. A song that I did not know at all until I started researching for this lecture is “Sweet Day, So Cool”, which is a very early song from 1864. It was one of his first three or four songs, and it has got a magic opening. What do you after that opening? The voice does the same sort of thing that we heard happen in “Orpheus with his Lute” - that is to say, the voice does not have a tune. You hear a high note, falling away. It is beautiful vocal writing. …that we feel we have halfway finished the phrase, but it is very important that we do not feel that. It can be made possible by the fact that the singer alone has the D sharp, and then what happens beautifully in the next bar can work. That wonderful Wagnerian chord works much better if the phrase has not interrupted itself beforehand. You will not find that in Schubert. That is what I call a mixolydian chord. The mixolydian mode, which is like the white notes on G, has a flat leading note. That very extraordinary D natural is peculiar to Sullivan. I shall now say a few things about “The Willow Song”. It comes from that same early set of Shakespeare songs, and it begins with marvellously surreal harp chords, which do not resolve. “The Willow Song” has wonderful non-melodic qualities. The voice alone has one of the most important notes and can thus bend the pitch. You will notice that I am singing the note flatter than the piano would make me. I detect, in Sullivan’s songs up to about 1870, the possibility that he is not thinking in the modern equal piano temperament. If I play this progression bluntly, on the piano, it does not sound, to my ear, as beautiful as it sounds when I play it on my 1828 Broadwood, which is not tuned in equal temperament. Fortunately, the singer can at least get us halfway towards the delicate things. Just to mention, questions of keyboard temperament are very important in Sullivan, because organs were not tuned in equal temperament until the twentieth century. Sullivan would always have expected his organs to sound a bit odd. It would be very interesting to know, for example, whether his hymn tunes were written in A Flat or G originally, or maybe A, because those three keys will sound very different. I will now turn to the first of several songs by Lionel H. Lewin. It is very difficult to uncover much information about Lewin, but one deeply regrets the fact that he died when he was about 26 because he was going to write the libretto for Sullivan’s great Arthurian opera. We shall hear, later, the song “Guinevere”, which will make us think that maybe Lionel Lewin and Sullivan would have made a terrific Arthurian opera together. I have come to admire Lewin a lot, but I have no idea when he was born and I can only tell you that he died in 1874, shortly after Sullivan had put him in the preface and thanked him in his hymn book (dated Easter 1874) Presumably, Lionel Lewin died in the second part of 1874, at the age of about 26. This is an American edition, in D Minor, which tries to sandwich two verses into a repeat scheme – that is to say, it only writes the music out once. However, if you look at this version, in a higher key, you will discover that there is one difference between the two verses. In each verse, there is a hairpin upwards, which means “get louder”. In the second verse, that hairpin is preceded by the word “crescendo”, which surely means the same thing? Why go to all the trouble of writing the music out twice, if the only difference between the two verses is a redundant use of the word “crescendo”? I have discovered that Mendelssohn very frequently uses the words “crescendo,” “diminuendo” and “hairpins”, up or down, in apparently contradictory or superfluous ways. I have come to the conclusion that, for Mendelssohn (as well as for Sullivan and Sterndale Bennett), this is a sort of psychological notation. If he is feeling impetuous and wants things to get louder, he will dash down a “hairpin,” but if he is thoughtful, pondering, he will write the word “crescendo”. This, I think, is perfectly unconscious in both Sullivan and Mendelssohn. My working hypothesis, if I see a composer using a mix of hairpins and written “crescendos” or “diminuendos”, is to think backwards in terms of tempo for the written word, and forwards in terms of tempo for the hairpin. This is the difference, I believe, between the two verses. Now, here is the introduction to “Guinevere”. Sullivan has done extraordinarily clever thing there: he has mixed two possible musical opening shapes. One, he has borrowed, from “Fingal’s Cave Overture”: that is to say, you hear it twice. So, we begin by thinking that Sullivan is presenting pairs of things. Lots of composers work in pairs. Another very common opening is: one thing, similar thing, thing twice as long. It is a musical fractal, if you like. The Germans have a word for it - die Barform or Bar form. It means two bits and a long bit. Some of Wagner’s operas are five-hour Bar forms. This is an immensely subtle way of introducing an enormous song, and I wanted to point it out because I think it is perfectly conscious composing. I think Sullivan was being careful to establish himself on a grand scale. Thanks to Christopher Irvine Brown, I recently stumbled upon the first, original Lionel Lewin song, “A Life that Lives for you”. It is a very interesting song indeed. It starts off and you think it is going to be a tune. Soft looks when lovers woo. And honours wrung from battle&apos;s chance. But all, but all from love of you. That proves the love is true. A life that lives for you. A life that lives, that lives for you. It is a battle-scarred warrior, trying to convince himself that he does not need the softer virtues in order to attract his ladies. Sullivan does a very interesting thing with that change of metre, but before I talk about that, I want to discuss his use of the mark sforzato, SF. If you look at Mendelssohn’s Songs without Words, you find that there are around seven sforzatos. The usual means of interpreting this mark on the piano is to “bang it a bit”. However, my contention is that these sforzatos in Mendelssohn are accents of a different nature: they are rhetorical accents; they are accents of delay or of prolonging. In this particular song, Sullivan shows himself to be a master of this kind of sforzato, because he has a wonderful way of tucking that metre into the lyrical melody he wants to write. What does Sullivan do where the meter changes? He writes a tune! Exactly the same progression, and I feel that it has been borrowed. And why not? I do not mean that it was stolen. I think Elgar must have known and admired Sullivan’s style. Now, this is one of my favourite Sullivan songs - “Birds in the Night”. It reminds us that, in his comical work as well as in his serious work, Sullivan remains a great composer. “Birds in the Night” is a rewrite of the lullaby from “Cox and Box”, and the original words are: “Hushaby bacon, on the stove top.” Improbably, Sullivan has written a great piece of music for this little spoof, and Lionel Lewin was the man whom Sullivan chose to rescue his great composition from its merely amusing quality. In fact, Burnand, who wrote “Cox and Box”, wrote to complain about the new words and Sullivan said he had told him about this: “Moreover, the new words are excellent, done in my own house and every line considered with regard to the requirements of the music.” That becomes very important. The song, for those of you who do not know it, has a lovely introduction. Sullivan does something very musically clever here: he turns that opening of his verse melody into the chorus. It is the same tune but with a slightly sinister edge. The “Cox and Box” version takes up only two sheets of paper because of this wretched repeat business, but in the subtle version, it is all written out, for reasons connected with those hairpins and crescendo marks. For example, in the first verse, the link into the chorus just says “Ral” – there is nothing else. It is a performing gesture, written in only the second verse by, clearly, a great performer, which is what Sullivan was. I thought it would be useful to have a look at a couple of tunes, because we are going to listen to some straightforward tunes this afternoon, as well as the more complicated songs. The first tune comes from the much maligned “Kenilworth”. I have a soft spot for Henry Chorley, who was the music critic of Athenaeum. He went to Leipzig and listened to the orchestra under Mendelssohn’s direction, and said, “Never before have I heard those minute aggravations of emphasis for which one thirsts so readily!” Now, these “minute aggravations of emphasis” are the sorts of things that Sullivan is notating in his “Songs without Words” with his hairpins and his sforzatos and his words “crescendo”. Mendelssohn was a great phraser, and I link this in my mind with the rather curious fact that Sullivan, follower of Mendelssohn in so many things, conducted, from time to time, sitting in an armchair. I have always wanted to try that because, sitting in an armchair, you are prevented from minute crisis management. You cannot deal with tactics from an armchair; you can only deal with strategy. What I think made Sullivan such a great conductor is that, from his armchair, he showed the phrase; I think his choral societies and orchestras were so acquainted with the style they were dealing with that they required only to be shown the phrase. That is one of the more melodic melodies that we shall be hearing this afternoon. The other melody that I am going to mention “You Sleep”, which is the English translation of an Italian stage show song. It is a nice little tune. The interesting thing is that pure melody nearly always allies itself with the stage. Sullivan seems to know that the difference between the drawing room, or the concert platform, on the one hand, and the stage, on the other, is that the drawing room and concert were places where you did interesting, intellectual things with tunes, whereas on the stage, you just had tunes. I do not know whether something was in the air at the time, but that is how “Sea Pictures” began, a year earlier. It is nothing like “Sea Pictures”, but there is the same progression. It sounds very English, to me. I am trying to pick out a shared “Englishness” in two great works by Elgar and Sullivan; the Englishness comes from a certain, soft sadness, but I am in controversial waters here. There is one of those soft discords that Sullivan is so fond of. …is introduced not by a hairpin, but by the word “diminuendo” - that is to say, “take your time”, and you need to take your time at that point. Similarly, the great climax after the agitato - when we think about these “lips that are for others” that one has been unfortunately kissing, “deep as love, deep as first love, and wild with all regret” – is marked by “at tempo”, meaning “slow down”. We found that, at every point, Sullivan was mercifully, ahead of his performers in articulating this extremely complicated structure.